The author’s first choice of knife. Photo: Paul Kirtley. One of the things I like about bushcraft is that many aspects of subject involve the use of tools. And I like tools. 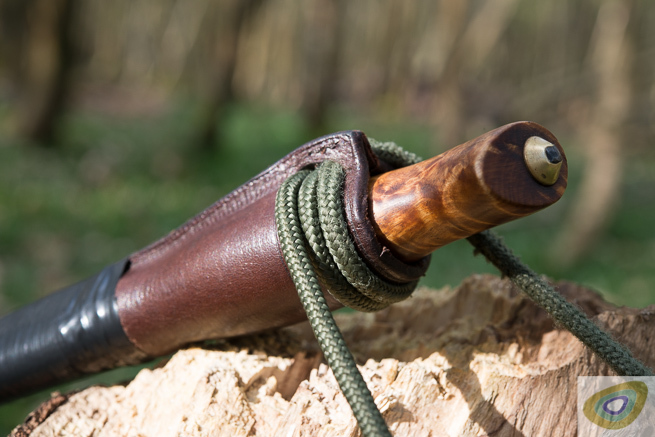 Most of the tools used in bushcraft tend to be cutting tools; knives, axes and saws being the main ones but others such as billhooks and adzes are also quite popular. Most bushcraft activities employ a knife of some description. This can sometimes be a specialised knife such as a spoon knife but more often than not it's a general purpose sheath knife. That's what I want to talk about here. 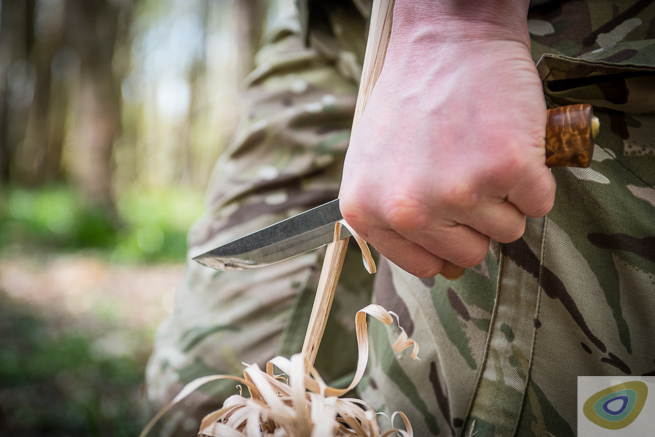 A good basic sheath knife should enable you to carry out any day to day cutting tasks whilst you're on the trail or in camp, as well as being serviceable for more specialised tasks. They tend to have a blade four to five inches in length with a handle about an inch longer. 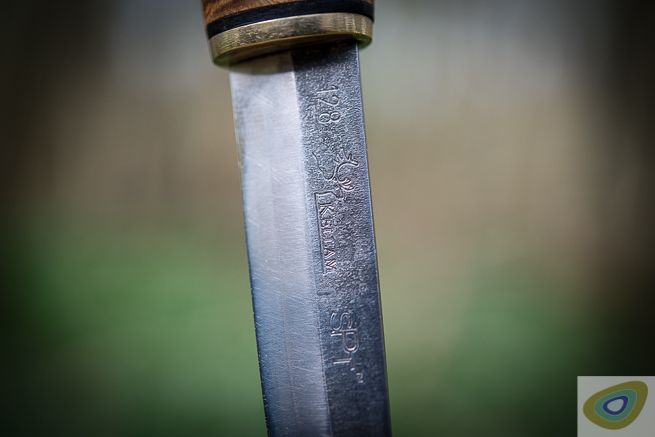 The blade is usually a “drop point” or “spear point” in profile, this means that the back of the blade curves down as the edge of the blade curves up until they meet at the tip. This creates a shape reminiscent of a leaf or spear, hence the name. The edge of the blade is made sharp with a simple flat bevel. This is known as a “Flat” or “Scandinavian” grind, and is ideal for woodcarving and simple to sharpen as well as being fairly robust and capable of taking a very sharp edge. The tang of the knife (the part which extends from the blade to form the handle) is the full length and full width of the handle, predictably this is known as a full tang. The sides of the handle, the “scales”, are riveted/bolted and/or glued to the tang. 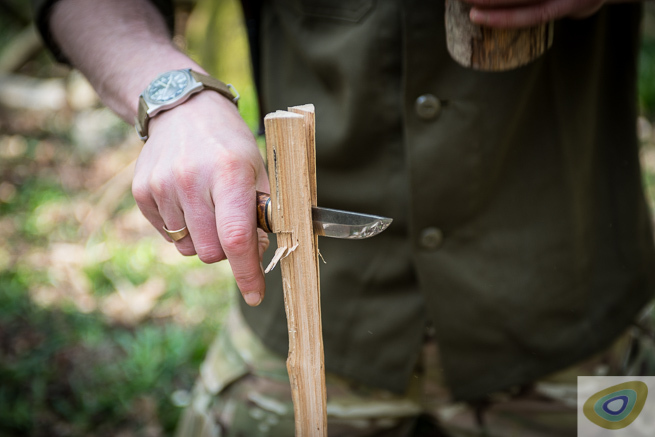 The Woodlore knife typifies many people's choice of a bushcraft knife. Photo: Paul Kirtley. The Woodlore knife is designed to be a jack-of-all-trades, most of its design features are aimed towards woodcarving (the "Scandinavian" grind specifically) but compromises have been made to make the knife more versatile. For example, the handle has been designed to allow the knife to be held comfortably and securely in a number of quite specific grips, as such it's not ideal as a woodcarving knife where a plain oval grip is preferred. The spear pointed profile of the blade isn't ideal for woodcarving either, it's designed more with animal skinning and bark removal in mind. The blade is quite thick for a carving knife too, it's been made thick to be robust enough for jobs like splitting wood, this thickness also makes the knife less than ideal for preparing food. As a compromise though it works pretty well, it's not bad at most tasks and very good at some. 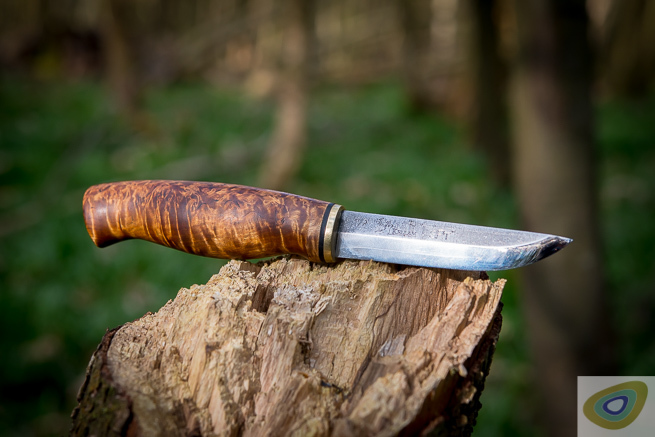 As such it's a very popular design of knife amongst bushcraft enthusiasts. The type of fixed blade knife that I prefer to use as my main knife is of a similar size to the Woodlore knife (it's actually a little shorter, both in blade and handle length), but of a different style. The style of knife that I favour is one that was traditionally used by Scandinavian outdoorspeople, the Finnish Puukko. 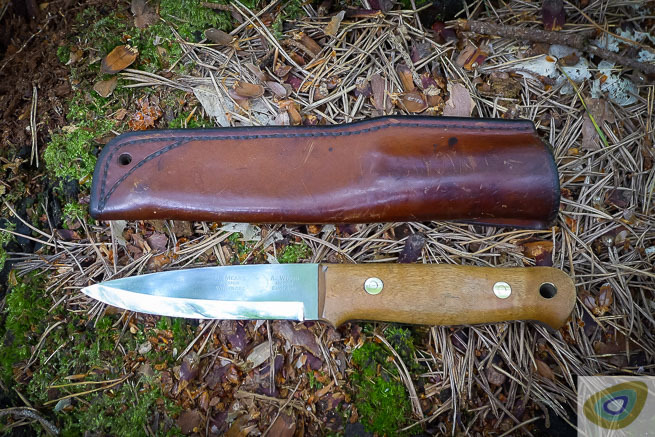 The Kellam Wolverine in the traditional Puukko style. Photo: Paul Kirtley. The Kellam is a little shorter than the Woodlore knife; the blade measures 90mm (3 1/2”) and the handle measures 115mm (4 1/2”). The blade has a “straight back” or “normal” profile, this means that the back of the knife forms a straight line from the handle to the tip and the edge of the knife curves up to meet it. This creates an asymmetrically shaped blade, effectively one half of the “spear point” seen on the Woodlore knife. The grind of the blade is identical to that of the Woodlore knife, a “Scandinavian” single bevel ideal for woodcarving. The tang of the knife is not a “full” tang like the one on the Woodlore knife. The tang is still the full length of the handle (in fact it actually extends a little beyond the end of the handle), but instead of being the full width of the handle it is actually narrower than the blade of the knife. This is known as a “stick tang”. The handle of the knife is made of a single piece of wood through the centre of the tang of the knife runs, the handle is glued into place and then part of the tang that extends beyond the end of the handle is peened over to secure the handle. 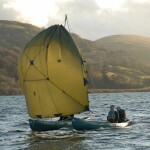 The design is slightly less of a compromise, as it wasn't designed with animal skinning in mind. The Kellam can of course still be used to skin game, it's just not quite so well suited to the job. I don't mind this slight loss of functionality as it's very rare that I have to skin large game. The difference in design, primarily the stick tang but to a lesser extent the profile of the blade, makes the Kellam considerably lighter than a similarly sized full tang knife. This lightness makes the knife less tiring to use for finer, more controlled, work but does mean that the knife doesn't function quite so well as a chopping or slashing tool. I find stick tangs knives to be more comfortable to use than those with full tangs, although this is purely down to personal preference, I simply think that they feel nicer in the hand. The author's knife in its sheath. Photo: Paul Kirtley. I bought my knife as a slight second; it had been dropped on the concrete floor of a warehouse and a little bit of the tip was snapped off, so mine's slightly shorter than standard. I've also slightly filed down the spine of the knife, so the spine no longer runs in a perfectly straight line from handle to tip, it now slopes down a little bit on the way, I did this to make the knife a slightly better woodcarving knife. I also created a good square edge to the spine of the blade as I was doing this to make the knife more effective when used to strike sparks from a fireflash. Kellam Wolverine blade detail. Photo: Paul Kirtley. I've altered the sheath a little too. One of the alterations that I've made is to whip part of the sheath with some thick polyester thread. I've done this for two main reasons: firstly, so that I can keep a large repair needle threaded with a length of strong linen thread behind this whipping, and secondly, because it hides the silly "wolverine" logo on the sheath. The whipping has the added bonus of providing me with a ready source of cordage should I need it (although I'd then have to find somewhere else to store the needle and thread). I covered the whipping with tape to help keep it secure, the tape also provides another resource that I can use in extremis. I also removed the belt loop and replaced it with a length of paracord tied with a double fishermans knot to make an adjustable loop. Detail of cord attachment. Photo: Paul Kirtley. This paracord loop allows me to carry my knife either hanging around my neck or over one shoulder and around my chest so that it tucks away under the opposite arm, much like a school satchel. Satchel style knife carry. Photo: Paul Kirtley. I prefer to carry my knife in this style rather than on a belt mainly because I find it more comfortable that way. I've been using the Kellam Wolverine as my main knife about the last eight years and it's served me well. The main things that I like about it are the lightness of the knife and the comfort of the handle. It works well as a woodcarving knife due to the relatively short blade and also the shallow profile of the blade, especially towards the tip which allows me to easily carve in confined spaces such as when carving interior radii. Only the thickness of the blade prevents it from being an ideal woodcarving knife, this thickness also makes the knife less than perfect for preparing food. Shaving curls on a featherstick with the Wolverine. Photo: Paul Kirtley. The thickness of the blade is, however, a compromise. A general purpose knife needs to be robust enough that it can be utterly relied upon and that is achieved in the Wolverine by adding a little thickness to the blade. This makes the blade strong enough for me to use it for heavy jobs; it works well for “batoning” to split larger pieces of timber. Batoning with the Wolverine. Photo: Paul Kirtley. Maintenance is pretty straightforward with the Kellam, as it is with most knives. I keep the blade sharp with regular stropping on a leather belt, and re-touch the edge as required with a bench sized oilstone at home a combination diamond/ceramic stone when in the field, much the same as Paul discusses here and here. The wooden handle of the Kellam requires little more than a regular clean and the occasional wipe over with a spot of boiled linseed oil. I have never waxed or oiled the sheath but I'm sure that it would benefit from it, aesthetically if nothing else. The downsides to this knife are that the lack of weight decreases the knives ability as a chopper, but I don't mind that too much. It's just something I have to consider and adapt accordingly. 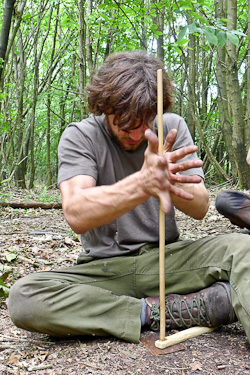 Stuart Dart worked as a Course Assistant, then Aspirant Instructor on Frontier Bushcraft courses during the UK summer seasons from 2013 to 2016. Thanks Janet, I’m glad you found the article interesting. I too use puukko knives, i find them so much more comfortable in the hand and pleasing to the eye, i like the traditional look. I’ve had my fair share of woodlore clones but 4mm stock is far too much in my opinion, my current ‘woodie’ clone is 3mm thick and more than enough. I can carry my puukkos on a clip which is sewn on to my smocks, stopping the nuisance of having something rubbing around my neck. They are superb cutting tools for wood and food prep, i never baton with a knife,so there’s no issue with the stick tang for me. Good to hear from another Pukko fan, I agree with you about the aesthetics of Pukkos, they look “right” somehow. Great tip about clipping your knife to your clothing, I do the same with some of my kit. Hi Ruud, good to hear from you. Nice to hear that you’ve copied my method of knife carry, the idea’s probably been around for as long as people have been carrying knives, I’m pleased to be passing it on once again. Make sure you let us know about your trip to Sweden, it’s always good to see what folk are getting up to. 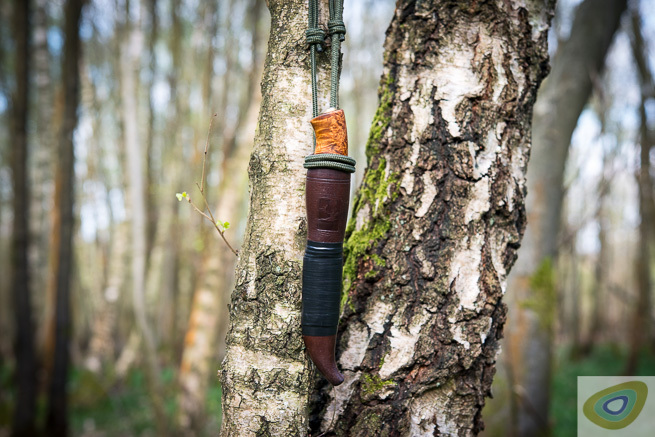 I have used various knves over the years, from a Woodlore clone (made by Julius Petersson) by way of Sami. and pukko style knives to a Skookum bushcraft tool (and briefly a 6″ Bowie, but I was young and silly). The woodlore clone is a great knife, but is far too heavy to be a good carver (but lovely for skinning and beheading a moose, or batoning firewood). The pukko/Sami style knives are great carvers and general bush knives, that are nice to hold and work with. The SKB is a good compromise between the two: the blade of a Mora/pukko, but with a slab style handle. But the traditional knives somehow feels more right, and I often carry a smallish Sami style knife (8.3 cm blade) in preference to the SKB, even if the SKB would be my preference for a survival situation, being slightly longer and definitely more forgiving of abuse. Thanks for the comments Par. I think that we’re in agreement that different styles of knives all have their purposes, for example that Bowie of yours was probably more of a fighting knife than anything else, after all that was their original purpose. Young and silly is a good excuse for many things though, Bowie knives included. Very interesting article, Stuart. I’m an artisan knifemaker and as such I very much follow what my customers want and I’m very glad to say that puukkos are finding much favour recently among professional users of outdoor knives. Very refreshing for me as they are a beautiful and elegant knife to make and the Sami-style of sheath is also very pleasing. 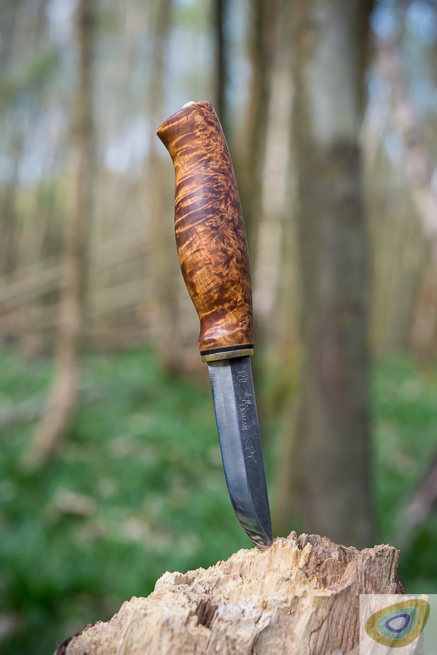 So refreshing having spent years making the full-tang drop point style knife typified by the ‘Woodlore’. When I’m on the ‘user’ side of knives I prefer to carry a puukko for all the reasons you state; for timber I have a saw and a small axe. My puukko, however, has a compound grind making the blade thickness slowly progressive towards the spine and a micro-bevel cutting edge. Have you ever tried a blade with such a cutting edge and what are your opinions of it? Hi Tim, thanks for the comments. Interesting that you’ve noticed a resurgence in the popularity of Pukko style knives, I think that within certain circles Pukko style knives have been somewhat overlooked in recent years, it’s nice to hear that practicality is still holding it’s own against fashion. The style of blade you describe sounds to me very much like it is convexly ground, do I have that right? If it is a convex blade then the answer would be no, not really. I’ve “had a play” with convexly ground knives belonging to friends and have found them to be, well, different in use to blades with a “normal” profile. I’ve never owned a blade with that kind of profile though so have never given one enough use to form a proper opinion. Well I don’t give my knives a convex grind – this I reserve for game prep knives and axes. Rather the primary grind is flat with a secondary, micro-bevel at the edge; this being the Nordik way. Thank you for the informative article. I also very much like my traditional Finnish Kauhava puukko. It has a 105 mm carbon blade approx. 2.5 – 3 mm thick and can be honed incredibly sharp and holds a very good edge. 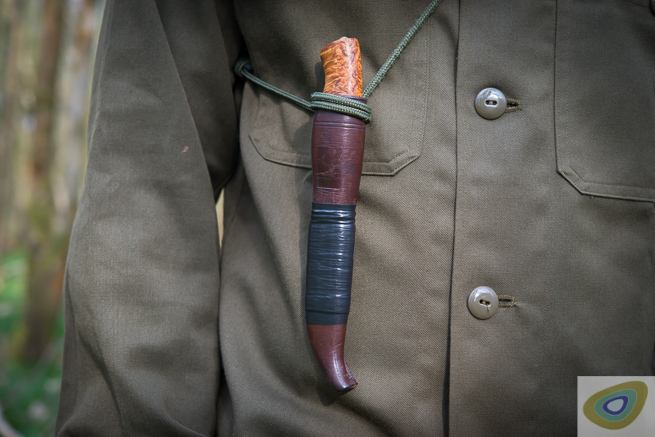 The handle is made of curly birch, leather and reindeer horn with a brass bolster. 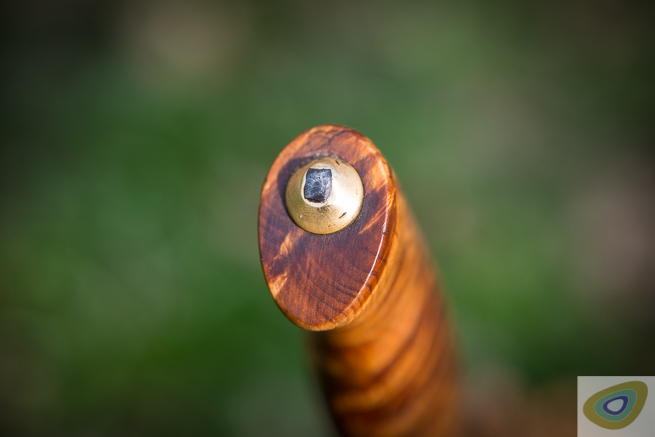 The stick tang is peened over to secure the handle in the same way as at your Kellam Wolverine. It came with a traditional sami style leather sheet. The whole package is as well as functional as pleasing to the eye and I simply love it. In the beginning I had a hard time to get used to the handle since it tapers considerably towards the blade and I was always concerned to slip off and cut my fingers. But this is not a problem as long as I don’t do any stabbing motion. When I stick the knife into wood I just take care to place my thumb over the end of the handle. It turned out that the slightly oval tapered shape of the handle is a real advantage for longer carving projects since it is more comfortable and less tyring than the slab style square almost fish-like handle of my full tang Casstrom No 10 Swedish Forest Knife. Carving is the real strenght of this light knife and due to the relatively thin blade it works also well for processing food. I rarely used it for batoning and stopped this immediately when I saw the handle of a Helle Eggen come loose while batoning although this knife at first glance seemed to be way more sturdy than my Kauhava. Hi Micheal, it’s good to hear from you. I agree with you entirely about oval handles, for bigger/longer carving projects they’re a great advantage. Being able to grip the knife in any way that you want and therefore being able to change your grip as often or as little as you like allows for much more flexibility in the way you hold your knife, which in turn leads to less fatigue. I suppose this is why oval handles have been around for so long and remain very popular to this day. That Kauhava puuko of yours looks like a lovely knife, I hope it serves you well for many years to come. Thank you for great reading!! Thanks Henrique, I’m glad that you enjoyed it. I use two knives. A Mora Classic as a small tasks neckknive and for other jobs I use an Enzo Trapper. Both affordable and doing the job for me. I love the scandi grind, the grind serves me well on bushcrafttaks like woodwork and preparing food. The handle must fit your hand very well. Try the knife you want to buy, like making a try-stick with it. Both very good knives Rody, I’ve used various Moras quite a bit over the years, I generally find them to be good functional items. I especially like the Mora 120, as a small carving knife it’s pretty much perfect for me. Stuart, Very nice article. My Wolverine is well over 10 years and still going strong. I am extremely fond of its quality and all round utility. In fact, it was my go-to knife for many years and never let me down. Survival instructor, Peter Kummerfeldt, originally introduced me to the puukko style knife because of its versatility and ease of maintenance in the field. Also, your method for neck or satchel carry appears to give you ready access to the knife even when wearing a heavy outer garment, coat, or rucksack. It’s a nice arrangement I look forward to trying. Again, thank you for excellent information on this great knife. Hi Wayne, thanks for the comment. It’s good to hear that your experience with this model of knife matches my own. Let us know how you get on if you do try the satchel style of carry. There’s definitely an aesthetic aspect to choosing a knife. Most people are as motivated by what they like as much as by what they need. Which is fine, as long as it doesn’t compromise functionality or the budget. I have a Becker Campanion as my general purpose camp knife. I chose it for its ruggedness but it’s too heavy for backpacking and it’s a bit excessive for the usual day hike, even here on Vancouver Island. It’s great for canoe camping. It’s a great knife where toughness is the priority. For that relatively narrow range of use, in my own case, the money could have been better used elsewhere. That knife is a great looking knife and sounds like it has features which are good for a small bushcrafting knife, but wouldn’t you want to carry a larger bushcraft knife for bataaning and chopping? I have two knives I carry, the Dora and I’m awaiting the Esee 6. The Dora is a great small bushcrafting knife, but it is not a complete tang through the handle knife. Do you have other larger bushcraft knives that you could review?? Keep the great post coming.. I am using a little strong knife with a 3 mm thick blade of 92 mm, 82 mm sharpened. The handle is 111 mm long, full tang. In the sheath the lengs is 216 mm all together. The thickest points are 19 mm at the end of the handle and 20mm where the handle goes in the sheath counted with the leather. It is branded with meru, bolzano, italy , and costed around 12 €. If I compare it with helle, martini, mora, even fjellkniven f1, which I also had in use for several years, I cant see big differences. Ok, the old original opinel and rusty mora with wooden handles are easier to sharpen, and the other skandinavians too, but the meru is fine for the price! The german army trousers in flecktarn which have a webbing of 20% plastic and 80% cotton and which you can buy used for less than 20 € and colour them at home in black, if you want to, are made from a very strong material, lightweight and fast drying. (The old green once are 100% cotton, thicker and its impossible to dry them). In my opinion the meru is a full size knife, I everytime have a swiss victorinox climber (with scissors) with me on the man. For stronger works i use the smallest fiskars axe with long handle, the smallest fiskars saw , and if neccessary folding frame sawivior. The forest axe belongs in my opinion in the landrover with a stihl motor chaine saw. So for me this small tough knive in the pocket is absolutely enough in all circumstances. It is under the flap so secure, that you can go swimming with that, when you thing, pulling a canoe is nicer than using the paddle! If you carry the knife like me, you have no problems in cities, i am living in Berlin too, yes, the knife is in the pocket, and who should care about? If I need it in garden and farm or forest its there like the victorinox, it simply belongs in that camotrousers. ( Which i do not use in the opera. ) Thats very comfortable for the brain and very cofortable for the body. You really should try that out! May be, you can stich such a pocket in your outdoortrousers too in the right side pocket (if you write with the right hand) if it is large enough. Technicly you can stich such a pocket with or without flap behind the sidepocket too, perhaps a bit higher, outside its easy to do, the bavarian knee long leather trousers have them there, opening to the outer, with 3 cm outlooking handle, pocket like a stiched sock at the inside. In Bavaria normal fashion, in northern germany i prefere the hidden way in the pocket. That is in my opinion the best way to carry a knife everywhere you come in long trousers or longer shorts along! And I am very convinced about that, because I am carrying knives since 40 years every day, in city and field, canoe and car, at bike , chair and armchair and in the sleeping bag!